Not that there was a lot of doubt, but the Pivotal Initiative spin-off of VMware(s vmw) and EMC(s emc), has now officially spun off and will likely go public, according to EMC CEO and Chairman Joe Tucci, speaking at an investors event in New York. 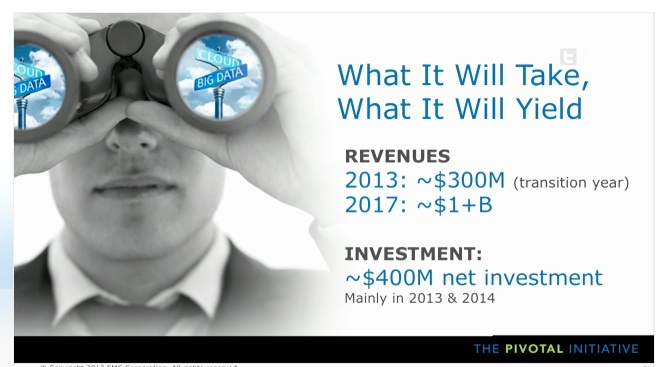 Paul Maritz, the EMC chief strategist who leads the spin off, expects it to be a $1 billion business within 5 years, but also warned it will need to make $400 million in investments to get to that point. 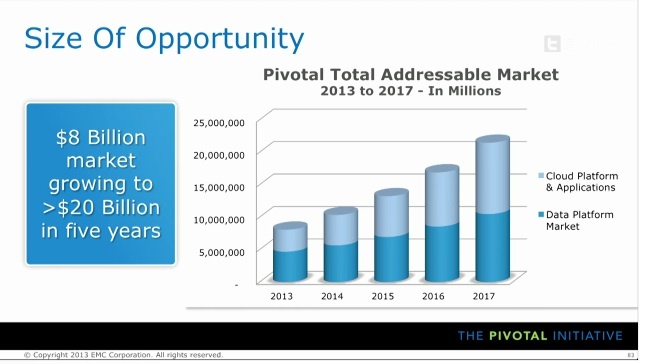 Pivotal is 69 percent owned by EMC, 31 percent VMWare with about 1,250 employees and $300 million in revenue, Tucci said. As has been reported, EMC contributed Pivotal Labs, Greenplum and VMware ponied up Cloud Foundry, Spring and Cetas. “It’s not the riskiest thing we’ve ever done with an experienced executive, Paul Maritz, taking charge,” Tucci said. Maritz is the former CEO of VMware, and was a longtime top executive at Microsoft(s MSFT). He will also speak next week at GigaOM’s Structure: Data event in New York City. What the newly minted Pivotal Initiative brings to the table is Greenplum’s parallel query and data processing strengths; Gemfire’s ability to rapidly ingest events (lots and lots of events); Cloud Foundry’s application development and deployment strengths and Spring’s Java rapid application development framework. The latter “gives us integration with legacy data sources and applications,” Maritz said. The Cloud Foundry PaaS, which was initially built and still runs on VMware’s vCloud technology will continue to do so but will also run on Amazon Web Services, Maritz said. That whole openness message was repeated throughout this morning’s marathon event. VMware also used Wednesday’s event to outline its Hybrid vCloud services with which it hopes to strengthen its public Infrastructure as a Service play against Amazon. This story was updated at 9:14 a.m. PST to include Paul Maritz’ remarks about the spinoff’s prospects and assets.